...and it belongs to Anna and Sean. Congratulations you two! This ring is AMAZING! How unique! Is the bride going to have a wedder or is this going to act as both? Ooh, hello Ms Polka Dot! 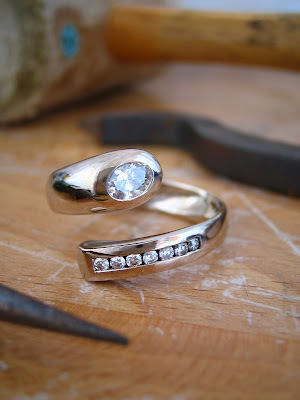 She will eventually have a wedding ring- a simple yellow gold band, which slots into the centre of this one.